Creating a visual pipeline in a CRM like Propeller gives you a birds-eye view of your entire sales pipeline. You can see exactly how many leads are at each stage of your pipeline, where the majority of opportunities tend to exit or stall, and which activities are eating up most of your sales reps’ time. The value of being able to visualize this information? It allows you to study your sales process step-by-step, so you can identify issues and pinpoint where improvements are needed. A reduction in stalled deals and bottlenecks. A shorter sales cycle and greater sales velocity. A higher win rate, since leads are more likely to close if they move through the sales pipeline quickly. Increased revenue, because you’re able to sell to more leads in less time. The goal is to make it as easy as possible to move opportunities smoothly from step to step, so you can take promote them from lead to customer with the least resistance possible. Here are some tips that will help streamline your sales process so you can quickly and reliably move more deals from lead to close. The less time you spend chatting with leads who aren’t ready to buy, the more energy you can put into working opportunities that are likely to close. That’s why it’s important to know your target audience and create an ideal customer profile that you can use to evaluate new leads. Qualification begins before you even contact a lead, and every conversation should be considered a step in the qualification process. You need to ask qualifying questions from the very first interaction and continue to assess whether each prospect is a good fit for your product and sales pitch whenever you speak to them. You can develop your own lead-scoring model or use an established system like the BANT framework to qualify leads and prospects. For instance, you should look at whether they can afford your product or service, how soon they’re looking to make a purchase, and whether the person you’re in contact with has the final decision-making power. Study your pipeline to identify any leaks that are costing you leads. That is, are your opportunities stalling or dropping out at a particular stage? Once you identify exactly where your pipeline is leaking, you can begin to figure out why – and works toward repairing it. For instance, if you have a ton of leads but a low conversion rate, there’s likely a leak at one or two of your pipeline stages. There are several reasons your sales pipeline might spring a leak, so you need to pinpoint and analyze the stage with the issue to come up with a solution. Maybe you need to focus on targeting a more specific type of lead or spend more time tailoring each sales pitch to an individual prospect’s needs. 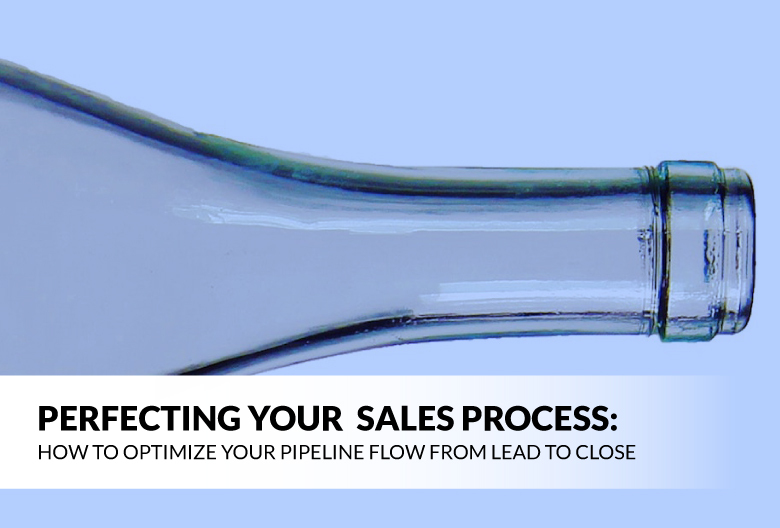 There’s no doubt it’s frustrating to watch leads get stuck at one spot in your pipeline. But the good news is, this type of bottleneck is often easy to recognize and rectify. In fact, with the right attitude, you can even use bottlenecks as an opportunity to learn and improve your pipeline. The problem isn’t that your leads are exiting the pipeline (that would be a leak); they’re just not moving forward. Once you identify that stage where leads are getting stuck, you can start to understand the root cause. This will allow you to make smart changes to your sales process to get things moving again and prevent future stalls. For instance, it might be that you aren’t following up soon enough or are failing to address common sales objections. When you figure out why you’re losing momentum, use that knowledge to strengthen your sales process by optimizing the steps and actions taken at that stage. Moving leads from initial contact to closed-won requires highlighting your product benefits at every available opportunity. This goes beyond delivering a killer sales pitch to providing value during each interaction. And how can you deliver value consistently? By knowing your lead well enough to personalize your offering, pitch, and demo. This includes asking qualifying questions to help you understand which offering is best suited for a particular lead; anticipating and pre-emptively addressing sales objections; and sharing anecdotes about how specific features have benefited similar customers in the past. The best way to track sales metrics is not to measure every single activity and every pipeline element you can think of. Rather, the key is to focus on the specific metrics that are relevant to your sales goals and business objectives. This approach prevents your reps from getting overwhelmed by too many numbers and targets, which allow you to pull greater value from the metrics you do track. You can also experiment with the ‘one metric rule’ – a tactic that involves rallying the entire team behind a single sales metric. Whether you focus on increasing the number of qualified leads who enter your pipeline each month, bumping up the number of cold emails your team sends out, or booking a certain number of sales demos, the one metric rule encourages sales teams to break the sales process into pieces and start by measuring and optimizing just one aspect of it. If you can focus on fully optimizing one aspect of your sales strategy at a time, you’ll eventually end up with a nearly perfect sales process. The power of sales follow-ups is often underestimated – which is probably why most salespeople need to follow-up with leads more often and more consistently than they realize. Did you know that 80% of sales take at least five separate follow-ups to close? 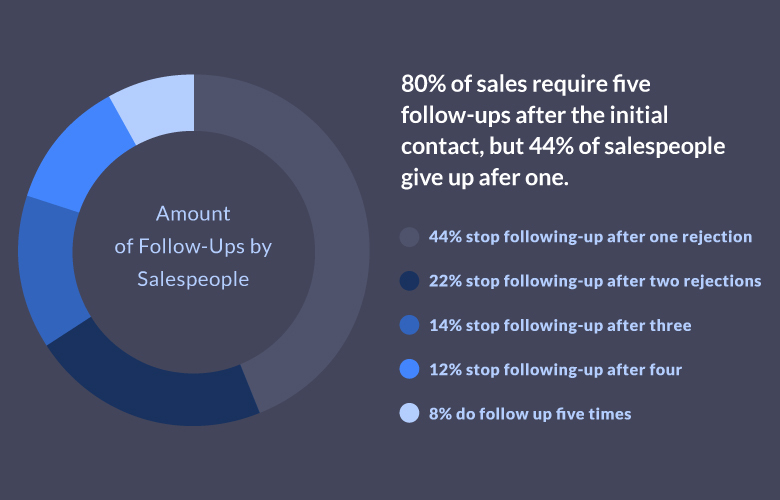 Unfortunately, 44% of reps give up after a single follow-up and only 8% of reps make it to that crucial fifth follow-up. With Propeller, you can create an email sequence that puts your follow-up efforts on autopilot – and automatically pauses when leads reply. This ensures you always follow up in a timely manner and never lead an opportunity to slip through the cracks, regardless of how many deals you have on the go. Ready to see how a powerful CRM can help you perfect your sales process and close more deals? Try out Propeller for free today!